If your focus is ALL about the data, then I imagine your webinars are functional, heavily driven by metrics, data-capture, and lead generation. Whereas, if you live and breathe your brand, you’re likely lost in the world of corporate image, creativity, style, and message. Does it really need to be a choice? No it doesn’t. And neither should it be. Fulfilling both form and function - gathering data while reinforcing your brand - starts with the right webinar platform. The best platforms provide branding and metrics capabilities in equal measure. If you pick a platform that performs one aspect well, but neglects the other, you are forcing yourself to make an unnecessary choice. 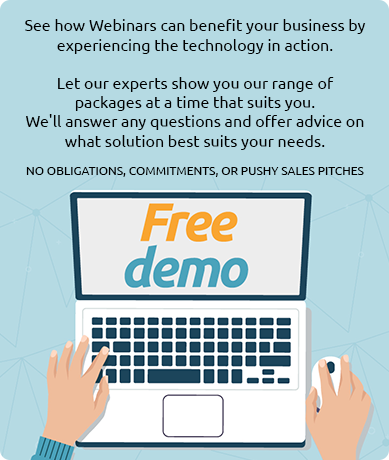 So, your webinars focus on generating leads and insight, you’ve spent all your time on how to capture and process information, and you’ve picked a platform that integrates well with marketing automation, data processing, and CRM tools. As a result there is great detail and value in the data your webinars produce, but you’ve ignored the impact a great user experience has on your audience’s engagement. Maybe the sign-up process is clunky, your design is bland and uninspiring, the portal doesn’t reflect the polished branding of your company, there is little or no interaction during the webinar and on-demand availability is an afterthought. Do this and you will struggle to get repeat visitors to your webinars. Put simply, the user experience just wasn’t good enough. The data you have generated is great, but it’s limited, you’ve basically invited someone to your party, got their name and number, found out a couple of their interests, thought “I’ll find out more about them next time we talk” ... and then you never see them again. These are the webinars that delight your attendees, but leave you (and your data-marketers) wondering if it was all worth it. The sign-up is seamless, access is easy, and the content is enlightening, entertaining, and interactive. Live questions are asked, polls are completed, additional content is downloaded, and every attendee is left feeling warm and fuzzy. People love coming back to these webinars. But, you’ve spent far too little time capturing this interactivity. Most likely your platform doesn’t have the functionality and capability to capture the attendee data and interaction, let alone connect it to your marketing automation and CRM systems. As a result, you have a poor, disjointed view of your webinar results or, even worse, no visibility at all! (Oh the horror!). The data you have collated requires laborious manual processes to make it usable, and it’s likely to be missing some crucial insight. You’ve basically hosted a party, people have turned up, had a great time, drunk all your booze, emptied your fridge, and left you cleaning up their mess while wondering “who WERE those people? !” Sure, they’ll keep coming back, so you’ll keep producing and presenting these much-loved webinar parties, but for all that hosting effort, you’re not going to enjoy the morning after. But all is not lost; you now have a reliable fan-base, so by changing your webinar platform you can still reap the rewards. No, just no. Don’t be this person. Just take your money and flush it down the loo. It’ll save you a lot of time and heartache. Congratulations fellow webcaster, you’ve done it, you’ve achieved perfection! You’ve got an audience of happy, interested, and engaged attendees, and you’ve got data, insights, leads, and metrics coming out of your ears. Your content is concise, precise, and salient, your portal is on-brand, visually pleasing, easy to use, and interactive, your presentation is slick, well-timed, memorable, and engaging, and every data-input, click, action, and report is being fed seamlessly into your CRM (are you a 247 Webcasting customer by any chance?). But be warned; now is not the time to rest on your laurels. As we all know, the world of webcasting technology is a rapidly changing landscape, if your platform isn’t early-adopting and constantly evolving, the perfection of yesterday could be the average of tomorrow. So, where do you start, form or function? Well, form attracts the audience and keeps it coming back, while function gains the valuable and usable insight. So it’s natural for webcasters to initially focus on building and retaining an audience. Find a webinar platform which doesn’t compromise on either. Yes, it’s going to cost a little more than an off-the-shelf, generic solution, but a saving isn’t a saving if it offers you zero Return on Investment! 247 Webcasting. We won't make you choose. I'm sure you'll want to get the best from your webinars too, so view our very own Webinar Presenter Checklist as a best practice guide. Hailed as “The best webinar platform for marketers” by Forrester Research.